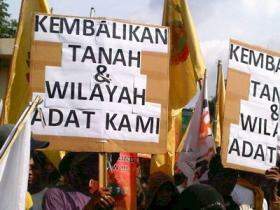 Protesters call for the return of their customary territories, Jakarta. In an open letter, AMAN, the Indigenous Peoples Alliance of the Archipelago, and Down to Earth, the International Campaign for Ecological Justice in Indonesia, urged President Yudhoyono and Prime Minister Cameron to follow up on their commitments to indigenous peoples. They called on Yudhoyono to intervene personally to issue a Presidential Instruction on indigenous territories which enables the implementation of last May’s groundbreaking Constitutional Court’s ruling. The Court’s decision takes indigenous peoples’ customary forests out of the control of the state and has the potential to secure rights to land and resources for millions of indigenous people. They also urged the President to repeal all regulations and decisions issued by the Forestry Minister which hinder the implementation of the Court’s decision and to ensure that the bill on the Recognition and Protection of the Rights of Indigenous Peoples is passed into law before the end of his presidency. There has been an alarming lack of progress in implementing the Court’s decision. Instead it is being undermined by new regulations issued by the Forestry Ministry - in particular Ministerial Regulation No P.62 amending Ministerial Regulation P.44/2012 on the Establishment of the Forest Zone. Meanwhile, Law No.18 passed in August 2013 on the Prevention and Eradication of Forest Degradation has been used to evict indigenous Semende communities in Bengkulu and to arrest twelve indigenous community members in Meratus, South Kalimantan. The organisations also urged Prime Minister Cameron to conduct a review of UK policy towards Indonesia so that conflicting policies on business, human rights and climate change are identified and amended to support the recommendations of indigenous peoples noted in the High Level Panel’s Report, and to support the speedy implementation of Indonesia’s Constitutional Court Decision. The Panel’s report calls for the sustainable management of natural resource assets (Goal 9). It highlights the fact that globally, over a billion people living in rural areas depend on forest resources for survival and income, yet the world loses about 5.2 million hectares of forest per year. It recognises that many of these forests have been traditionally managed by indigenous peoples and local communities and when forests are cleared, people and communities lose a traditional livelihood source, societies lose an important natural resource and the destruction of forests also accelerates climate change, which affects everyone.